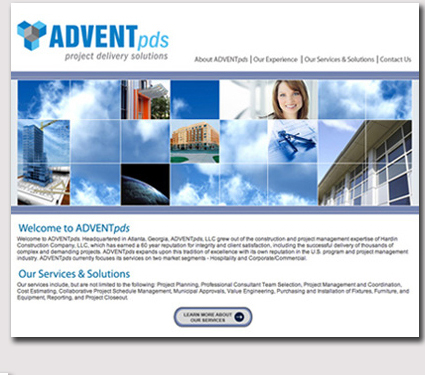 Advent PDS is a construction and project management company owned by Ken Gwinner. Ken came to WebXperts initially to create a cutting edge website that did look like anything his competition currently had online. Our design experts spent weeks design and refining mock-ups to come up with the first iteration of Advent PDS' website. Our web experts spent time ensuring the design and content would secure a top ranking on Google, Bing, and Yahoo. Within a week the Advent PDS website was online, placing on the first page for all of Advent PDS' keywords, and generating revenue for Ken's startup. Eventually the company was acquired by Hardin Construction. Ken reengaged with WebXperts to redesign his website to look more corporate and inline with Advent PDS' new parent company. WebXperts met with the Hardin team, learned about their design requirements, and presented mock-ups to the entire team in under a week. The website was online and ranking equally as high as the first version in under a month.